Once upon a time, in a country not so far away and a time not so long ago, a political party came to power with promises of hope and change. The crowds chanted "Yes We Can! ", "Yes We Can!" with heightened enthusiasm because everything was going to be alright now. That was not to be. The time is now eighteen months later. Chants have changed to "Yes We Can?" The game of redistribution, excess taxes, saved jobs, bailouts, blame, and apology is well underway now and your only goal is to survive its onslaught. Good luck! 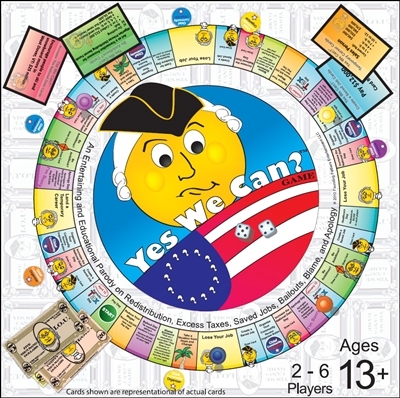 Yes We Can?TM Game is a parody meant to both entertain and educate. As the country's Founding Fathers look down on the current situation, there are many obstacles you will confront throughout the year (around the board). You will be faced with wealth redistribution days, patriotic tax days, bailout days, and government apology days. To make things worse, you will often help to increase the national debt and to create saved jobs. Unfortunately, these last two are real government spending programs which will enlighten you about 100 of the most recent and outrageous ways your real taxes are being spent. But don't despair! If you do have a temporary career - temporary because you may lose it soon - you will get paid with IOUs assuming your wages have not been sufficiently reduced by the time you get to pay day. Of course, you can always be fortunate enough to blame someone else for your problems, be ambitious, but not too ambitious, by taking on a part-time job, organize your community, or just take a vacation from hope and change.